After perusing this perplexing note, I immediately contacted our very special Florida Key Correspondent, Captain Charmaine Smith Ladd, and asked her to report on this potential gathering storm cloud at her earliest opportunity. Charmaine’s article below is the result of this contact. Before beginning a short (at least for me) editorial comment on all of this, a word of caution. Captain Charmaine tells me that this is all very preliminary, and it’s probably not time to yet raise any red flags. 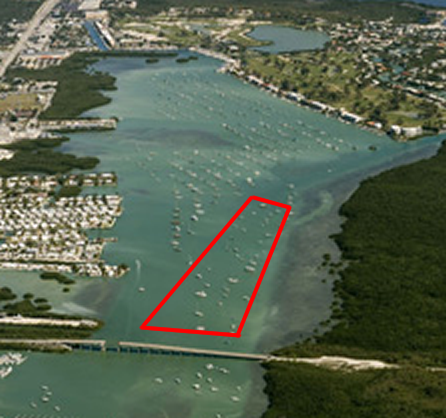 However, with that being said, this news about potentially restricting anchorage on much of Boot Key Harbor, outside the popular mooring field, comes hard on the heels of Marathon substantially raising fees for moorings and dinghy dockage (see /?p=79332). Taken together, we are worried that Marathon, which has had a decidedly “cruiser friendly” reputation for many years now, may soon be perceived as a “cruiser unfriendly” port of call. Such a point of view alteration would be a tragedy for all! Many cruisers look forward to spending their winter months in Marathon year after year, and these happy snowbirds undoubtedly make a huge contribution to the local economy. The city’s business community would suffer, and cruisers would lose out on a very pleasant port of call. Let’s all dearly hope this situation does NOT come to pass! Finally, I am told by sources OTHER THAN Captain Charmaine, one of (but not the only) driving force behind these new, proposed anchorage restrictions is the old bugaboo of derelict vessels. Apparently, a number of the “vessels” (though certainly not all) that would be displaced by the proposed, new Boot Key Harbor anchorage regulations, are of the variety that never move, and may never move again. Sigghhhh, once again cruisers are being forced to suffer for these sorts of derelicts. May I get up on my soapbox once again, to remind one and all, that derelicts can be dealt with by the application of marina salvage laws, and strict enforcement of MSD regulations. OK, enough of my “short” editorial comment. PLEASE read Captain Charmaine’s article below carefully, study the map below, and then let us hear from you concerning this matter. As always, one of the easiest ways to record your input is simply to click the “Comment on This Posting/Marina/Anchorage/Bridge” link below. WE NEED INPUT FROM THE CRUISING COMMUNITY CONCERNING THIS GATHERING STORM CLOUD! PLEASE LET US HEAR FROM YOU! Had a very cordial conversation today with Rich Jones, the Senior Administrator for Monroe County who has the task of drafting language for proposed anchoring ordinances as per the Pilot Program. There has been some confusion as to what is happening down here. Boot Key Harbor City Marina recently increased their rates. That has nothing at all to do with the Pilot Program, nor was it done to discourage others from coming to the Keys. It was strictly a book-balancing necessity. 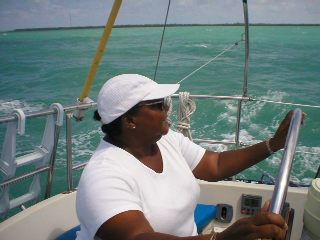 With that said, there are those who feel the rates unfairly squeeze those who opt to anchor rather than take a mooring. It remains to be seen whether or not the Marathon City Council can help to make the increases more palatable to all boaters. The economy is tough on everyone these days. The recent fervor over what is occurring down here is based on some confusion. These changes have been in the works for over two years now. For some it seems as if it coming out of the blue. That is not the case. I’m hoping to bring some clarity to what is happening with regard to the Keys and the Pilot Program. The proposed ordinances will go before the BOCC for approval at a meeting here in Marathon scheduled for March 21st. The ordinance currently is still in its “Drafting” stage, thus I have nothing in writing to post for your perusal at this time. It will be forthcoming as soon as it is established. Rich Jones has assured me that we will be talking often during this process, as we have up to this point. He is very attentive to the needs of cruisers and I truly have a lot of faith in him. Mr. Jones informed me that the Marathon City Council added two items they wanted addressed: 1) No anchoring in Sister Creek, and 2) No anchoring off Sombrero Beach within the proposed No Anchoring Buffer Zone. Whiskey Creek would still available for anchoring but it’s very limited back there as it is quite narrow. That too has added to the recent confusion on what impact the Pilot Program will have on Boot Key Harbor. These two particular changes were first brought to light nearly two years ago. In a nutshell, the general gist of the proposed anchoring ordinances in BKH [Boot Key Harbor] is that anchoring will be allowed ONLY in the “Designated Anchorage” area (see photo). ALL other areas within the red outlined area under BKH management will be off limits for anchoring unless doing so for Safe Harbor in the event of extreme weather. This plan will displace a lot of boats here in BKH as they move from prohibited areas and into the Designated Anchorage and has caused much local uproar. I’ve mentioned the concerns about the fact that the mooring field does not take reservations and that cruisers who wish to take a mooring will more than likely have to sit outside the Harbor as room to anchor inside will be subsequently severely limited. The problem is that the City Marina does not, as a policy, take one’s information until the vessel is INSIDE the Harbor. I am hopeful that policy will change if these ordinances eventually take effect. I am also hopeful that Sister Creek can open up to allow, at the very least, those awaiting a mooring assignment to anchor there. It seems this arrangement could easily be regulated. 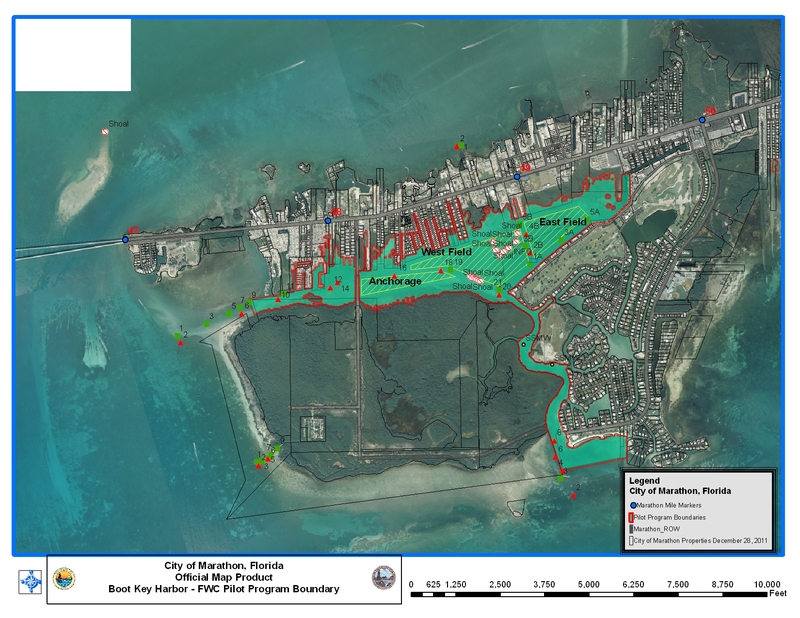 The proposed “No-Anchoring Buffer Zones” in BKH will no doubt greatly reduce the size of the Harbor during season. Many cruisers will be discouraged to come here if they cannot be relatively certain there will be a safe place to anchor while awaiting a mooring ball. Along with the increased rates the City Marina is charging for access to their land-based services, we have more than a few Unhappy Cruisers right now. I do think that confusion as to what all is occurring and how it occurred is adding to the anxiety and the general feeling of the Keys possibly becoming unfriendly. The fact that we have Monroe County and the Cities of Marathon and Key West trying to work together to suit the needs of their respective communities also adds to the confusion. They are separate entities joined within the Pilot Program. For cruisers and boaters wanting to keep apprised of the Pilot Program, please continue to follow the Salty Southeast Cruisers’ Net, and join us at Mariner’s Barr (Boaters Anchoring Rights & Responsibilities, http://www.marinersbarr.org/). We are also located on Facebook (http://www.facebook.com/groups/MarinersBARR/)! Please feel free to express your concerns to the Marathon City Council, the BOCC, and/or the Marathon Chamber of Commerce. There are good people on these panels who want to do the right thing. If you have something to say, there’s no time like the present. Be SURE to follow this link to read some of the most thoughtful discussions we have received from the cruising community in many years.